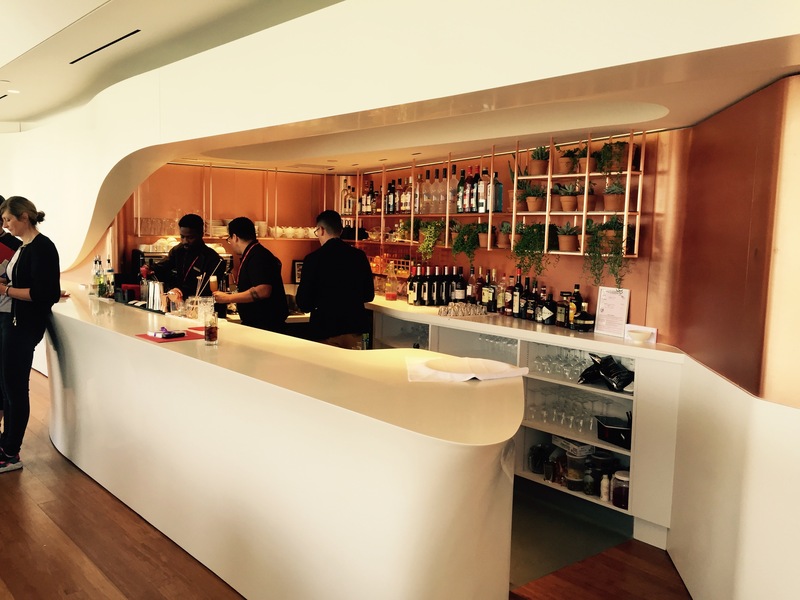 2015 is a big year for Virgin Atlantic’s Los Angeles operations, as it celebrates 25 years of flying the route from London, the beginning of its Dreamliner operations on the route, and now the opening of its newest Clubhouse. 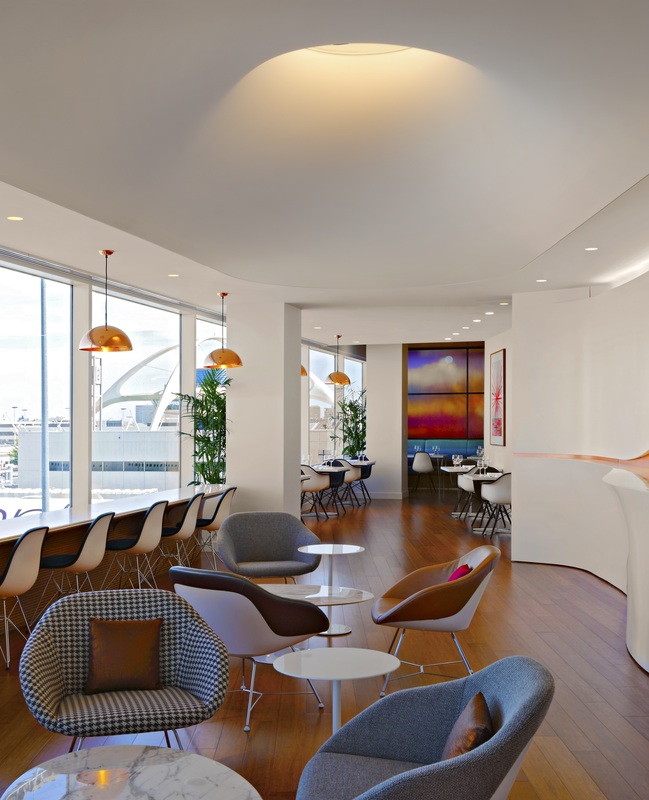 The 4,000ft² lounge is located in Terminal 2 at Los Angeles International Airport, which itself is undergoing major renovations to ensure its passenger experience isn’t left in the shadow of the neighboring Tom Bradley International terminal. When we visited on May 8 the terminal was still a work in progress, but the paint had just dried in the Clubhouse. 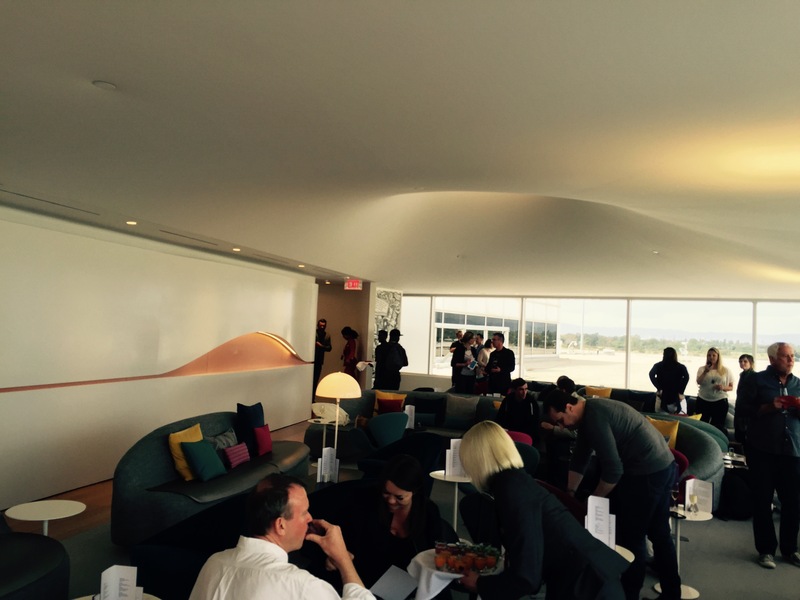 The £2.5m (US$3.9m) lounge is smaller and less dramatic than the Heathrow and New York outposts – befitting the more laid-back Californian lifestyle and the smaller required capacity for its twice-daily departures (VS008 at 5:55pm and VS024 at 10:20pm). The 90-guest capacity is ample for the mix of A340-600s and B787s currently flying the route (47 and 31 Upper Class seats, respectively), especially when the route becomes all-Dreamliner in 2016. The spare capacity will not got to waste, as Upper Class ticket holders can take a guest into the Clubhouse, and top-tier Virgin Atlantic and Delta card holders can also access the lounge. A day pass for the Clubhouse is also available to economy and premium economy passengers for a US$60 fee. We accessed the first floor space via the elevator, but a smart new staircase is nearing completion which will provide a grander entry experience. When the lounge is closed a large white door seals off the space, but during opening hours (2:00pm-9:30pm) the door slides back to reveal the familiar white backdrop of a Clubhouse reception. This provides a blank canvas for the receptionists wearing the stunning scarlet Vivienne Westwood uniforms – the ‘Virgin red’ element the airline wishes to emphasize (former Virgin Atlantic head of design Luke Miles explains HERE). 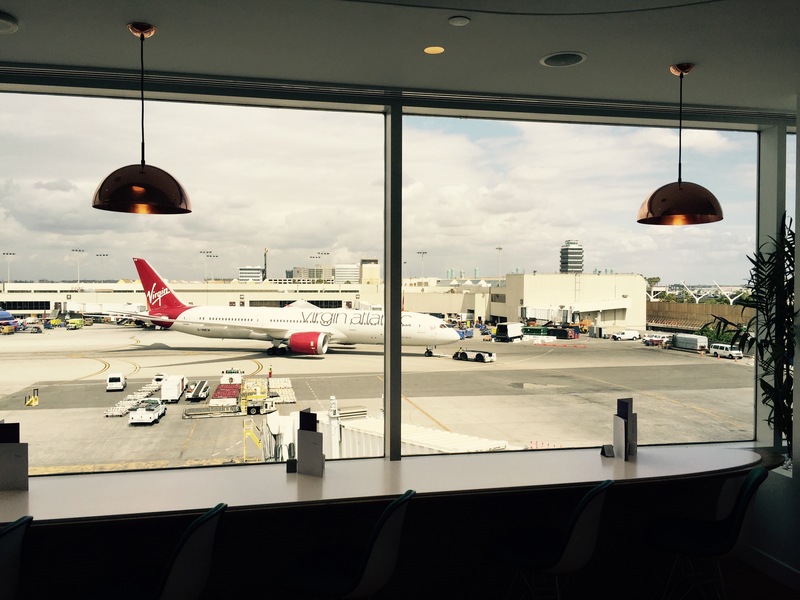 Virgin Atlantic had a choice of two spaces for the Clubhouse, but elected to take the former Air France lounge as it was the most suitable size, and its double aspect north-easterly outlook means the blazing Californian sun isn’t overly strong in the space. The dual aspects also offer views of the Hollywood hills (eagle-eyed visitors can just make out the famous sign) and the apron, which at the time of our visit was hosting Birthday Girl, Virgin Atlantic’s first Dreamliner. The lounge was originally a rectangle but the airline’s internal design team worked with Manhattan-based Slade Architecture (which also worked on the JFK and Newark Clubhouses) to divide the space diagonally, with back of house operations such as the kitchens and restrooms in the inner half, and the lounge space on the outer half. Upon entering the space – with a little ‘compression and release’ effect through the opening – the eye is drawn to the ceiling. The sculpted surface is a plastic membrane imported from France and installed using heat to stretch it into place. According to James Slade, co-founder of Slade Architecture with his wife Hayes, the ceiling concept was inspired by the famous 150m-long Marsyas membrane sculpture by Anish Kapoor that filled the turbine hall in London’s Tate Modern in 2002. The ceiling would of course be higher without the membrane, but the team felt that the design was more dramatic and it also takes the ceiling line down from the skylight to the top of the windows, which gives them the appearance of being full height. The undulating surface is also intended to naturally pull visitors through the space so they can explore what it has to offer. The colors you do see were selected to reflect the landscape and vibe of California, with a clean and simple aesthetic and flowing surfaces that reference the beaches, the landscape and the mountains. 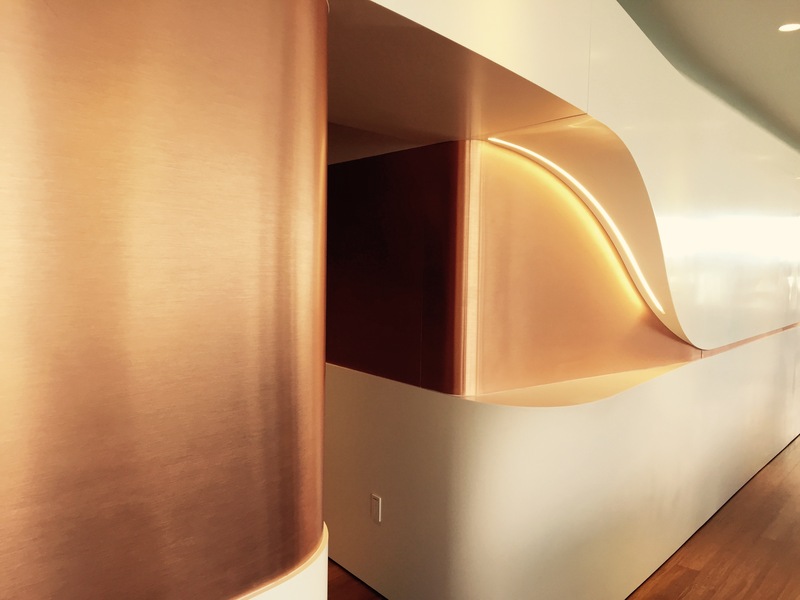 We went with the flow to the bar area, with the undulating copper on the surrounding ‘Flow Wall’ symbolizing the mountains, warmth and sunshine of California. 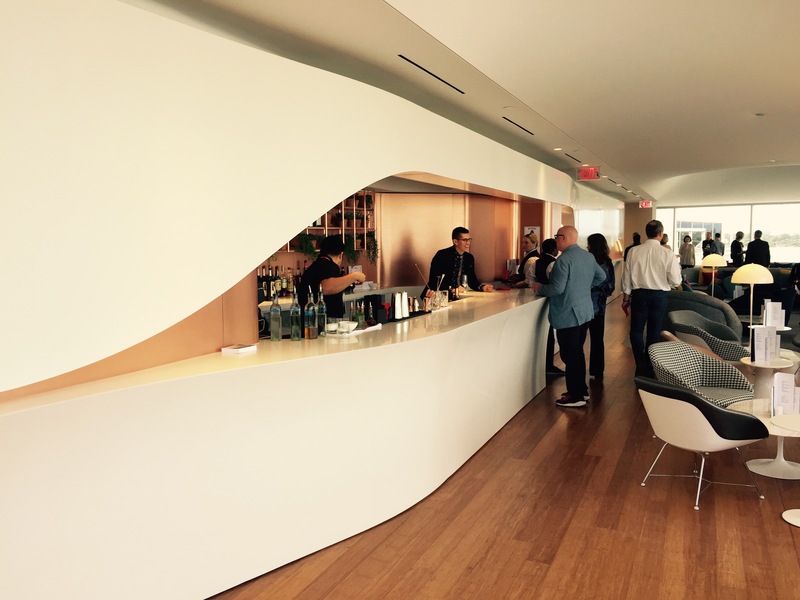 The white Corian on the bar surface also references the Corian used in the B787 bar area, pulling together the travel experience. In keeping with its locale, as well as a range of cocktails, the bar serves a range of pressed healthy juices from trendy Californian outfit The Juicery. The team elected not to have bar stools so the bar space remains clear for orders and to maintain an uninterrupted flow in the space. 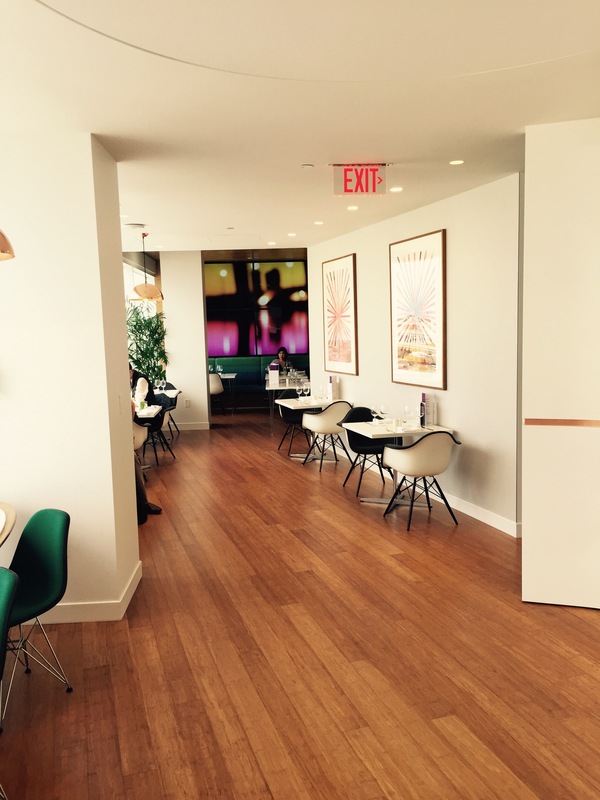 Beyond the bar, at the rear of the lounge, is a bistro area for dining (menu below), where travel-friendly meals designed by the Century City hotspot Hinoki & The Bird can be enjoyed without being disturbed by bar traffic. 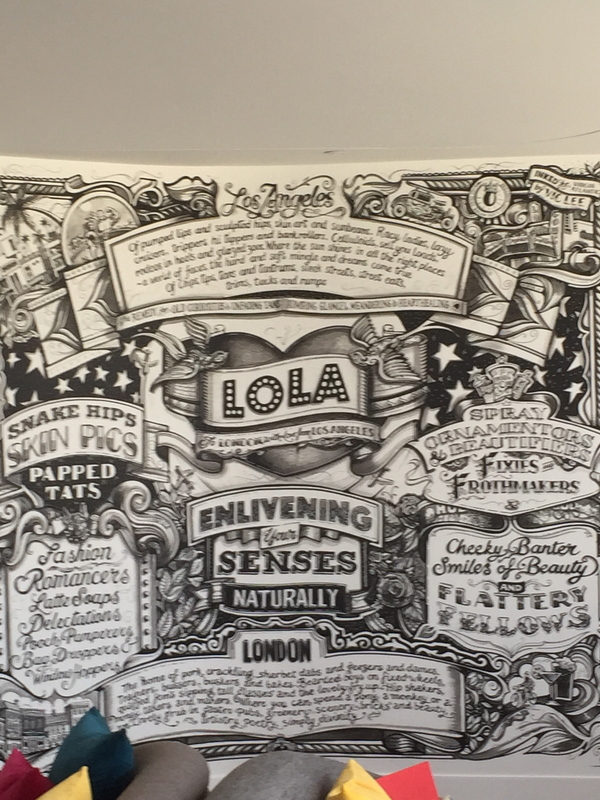 The other end of the lounge also has a striking artwork – a tattoo-style mural hand-drawn in pen and ink by London artist Vic Lee. 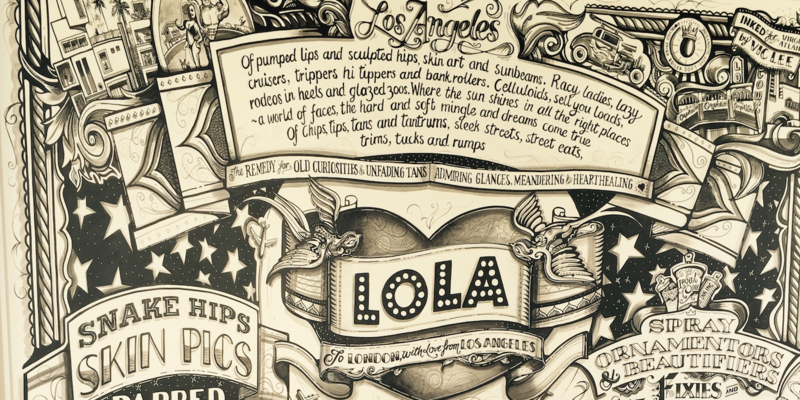 Named LOLA (To London with love Los Angeles), the work brings together the two cities through witty words and images. Lee had planned many of the terms he would include before beginning the work, but let the space inspire him as he drew the piece freestyle over four days, surrounded by contractors fitting the ceiling. A few of the terms in London’s ‘cockney rhyming slang’ mystified onlookers, while as a Brit I was baffled by a few LA terms, but a handy glossary is available for visitors. If you want to know more about monkeys, ponies, tons, fixies and glazed zoos, see our guide below. The artworks are clever choices as they both engage the viewer, one through moving images, the other through a playful mix of words and drawing. The furnishings are also works of art, from iconic pieces such as Arne Jacobsen’s swan chair and Knoll turtle chairs, to Eames Eiffel chairs and bespoke sofas. 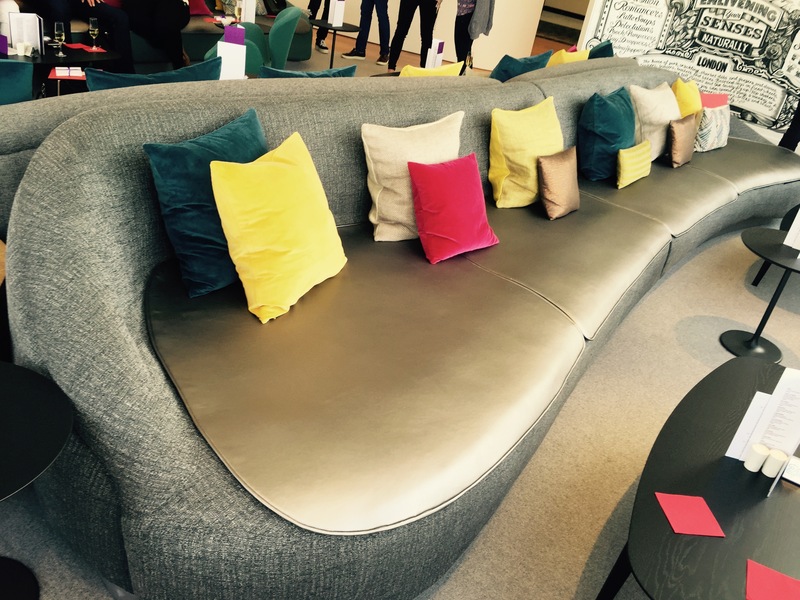 The sofas again reflect dunes and mountainscapes and have a cool futuristic feel, with silver leather seat pads that can be removed for refurbishment. The Virgin team gave Slade a clear color concept and collaborated with them to select materials that help play out that vision. The many cushions are a great source of color and some of them, such as the copper-colored ones, are bespoke, while others were sourced locally in the hip boutiques of west LA. 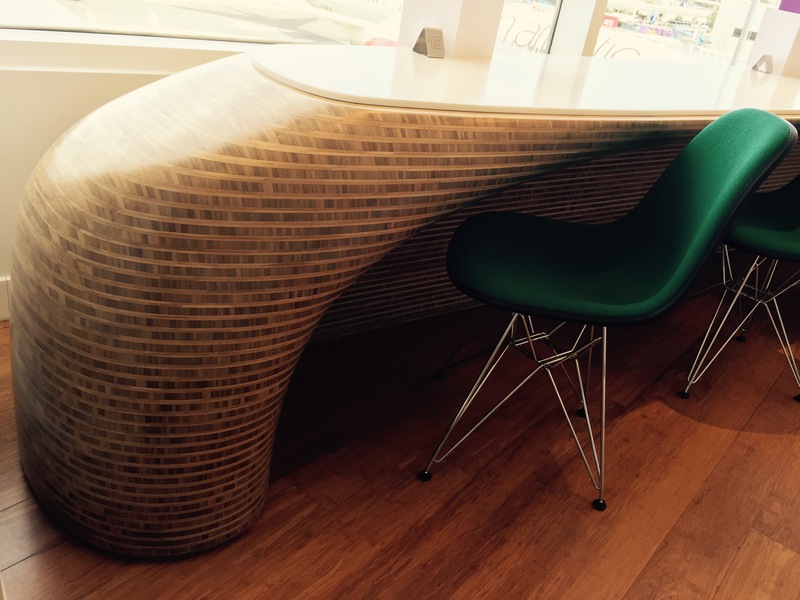 The desk facing the apron is also bespoke, with a swooping bamboo finish inspired by surfboards and boat hulls, again topped with white Corian. 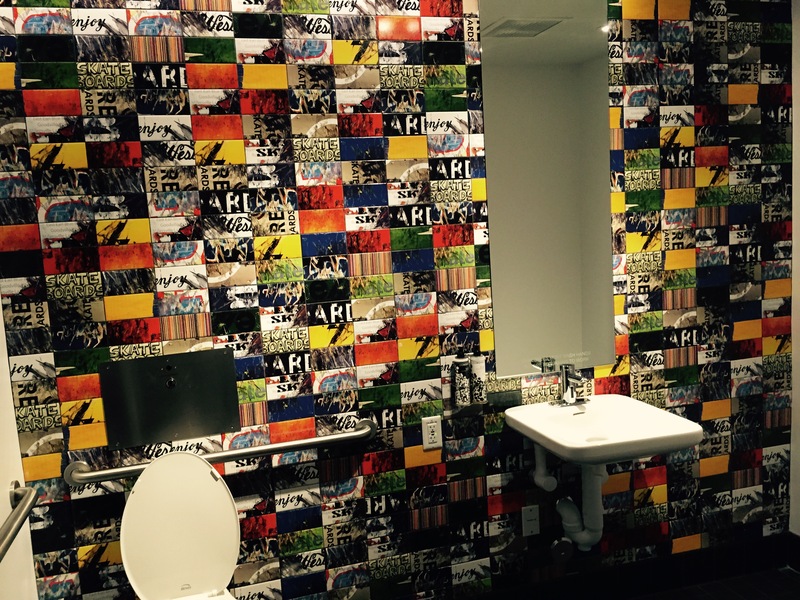 The space feels happy and sophisticated, but Virgin Atlantic always likes to show its cheeky side, which becomes apparent in the restrooms. Enter the appropriate door (aviator shades indicating the gents, cat eye shades for the ladies) and you are hit by an unexpected riot of color; the team took high-resolution photos of well-worn skateboards (a big theme of Venice Beach) and printed the images on to the wall tiles. It takes a moment to work out what the images represent, increasing the passenger engagement and enjoyment of the lounge experience. 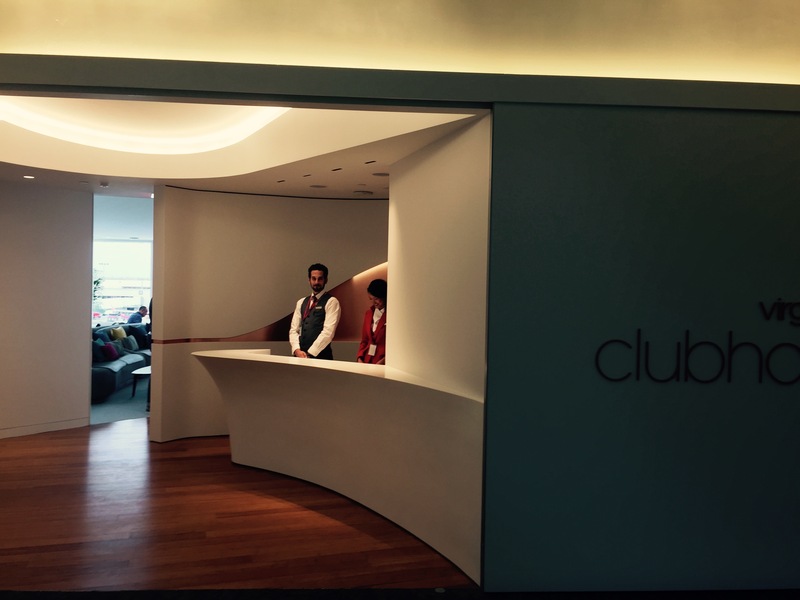 The LA Clubhouse may not have the same ‘wow’ impact on visitors as its Heathrow and New York counterparts, but it is a pleasure to visit and has enough cheeky features to give the Virgin Atlantic feel without overt branding. The real trick is the subtle touches that intrigue and engage the visitor. 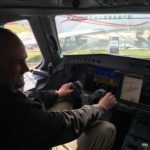 The experience will soon get even better as work concludes on Terminal 2 and Virgin adds a refreshed check-in area and introduces a meet-and-greet curbside chauffeur drop-off service for Upper Class guests. And indeed I do want to repeat the process. If you’re interested in the history of Virgin Atlantic’s Clubhouses, we have an interesting feature by the airline’s ‘Lounge Lizards’ discussing everything from pop stars to daleks, which can be found HERE.